Depending where you live, it may have begun to feel like autumn weeks ago already – or you could still be experiencing very warm temperatures. The trees may be full of color, just beginning to turn – or perhaps they’re still completely green. Whatever you see outside your window, the calendar says the season begins today. 🙂 The “show” isn’t far behind! I made this photograph at Acadia National Park in one of my favorite spots there: Sieur de Monts. 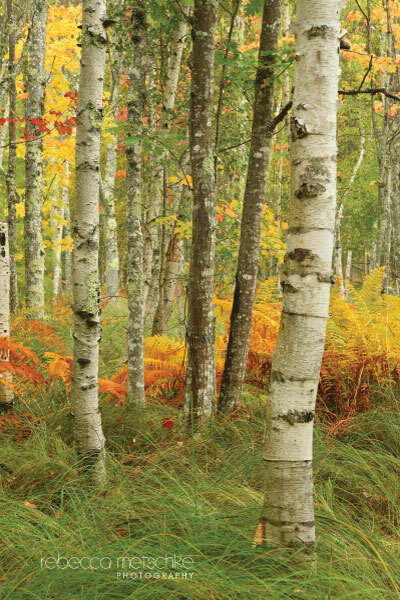 The long, lush grasses and ferns painted in fiery colors decorate the ground beneath stands of birch trees: a spectacular sight. Even though Acadia and Bar Harbor are packed this time of year, if you’re out early – or in the rain (as I was on this day) – it’s possible to find quite a bit of elbow room.